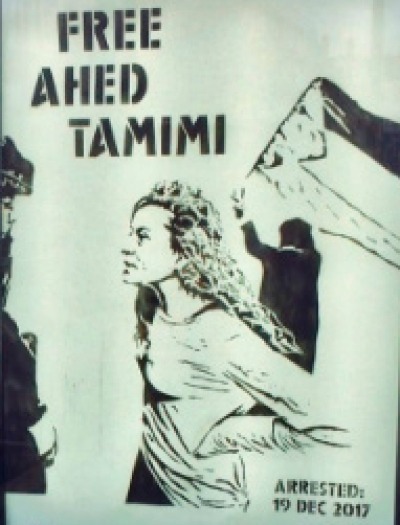 Ahed Tamimi, the fierce 16-year-old Palestinian girl arrested last month for daring to confront an Israeli soldier who’d allegedly shot her cousin in the head, has been indicted on 12 vengeful charges, from assault to incitement. Her arrest stemmed from a December protest in her village of Nabi Salah, which for years has stubbornly protested the Occupation and its rapidly growing illegal settlements. During last month’s action, an IDF soldier shot a rubber bullet into the head of Muhammad Tamimi, Ahed’s 14-year-old cousin. When two armed soldiers, including the shooter, then returned to Ahed’s home demanding entry, she’d had enough. Video captured Ahed furiously trying to slap and kick the soldiers as she screamed for them to get out; her mother, meanwhile, scrambled to get between them. There’s no video of the shooting itself – thugs firing state-sanctioned bullets into peacefully protesting teenagers’ heads is business as usual for the putative most moral army in the world – but “provocations” like a slender, fearless 16-year-old girl wildly kicking said thugs in the shins was deemed newsworthy, and the video spread. 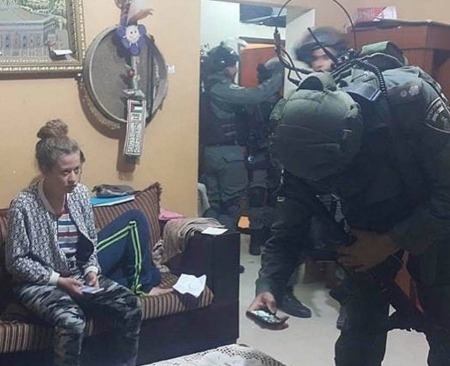 A few nights later, under cover of darkness, the IDF returned and arrested her; since then, she has been shuffled between several prisons and police stations. When not in court, she has been held in isolation cells under 24-hour surveillance and faced attempted interrogations with neither a parent or lawyer present. Ceding to military wishes, a judge has three times extended her detention, citing the “risk” she poses to Israel. This entry was posted on January 5, 2018 by Vox Populi in Opinion Leaders, Social Justice, War and Peace and tagged Abby Zimet, Ahed Tamimi, George Galloway, Holding A Mirror Up To A Shameful Occupation, Israeli occupation, Israeli Police Abusing Detained Children, Israeli-Palestinian conflict, Nabi Salah, Palestinians, peaceful protest.